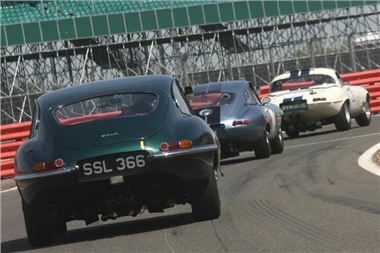 The iconic Jaguar E-type – celebrating its 50th anniversary this year – has been voted the UK’s favourite sports car by race-goers and classic car fans. Almost 3,000 visitors to an on-line poll voted for their favourite from a list of 15 hopefuls. The E-type sprinted into an early lead and at the chequered flag had claimed nearly one in four votes to beat the evergreen Morgan into second place. The brutal TVR Griffith claimed the final podium spot in third. The poll was run by the organisers of the Silverstone Classic, the world’s largest classic motorsport festival which takes over the Northampton circuit over the weekend of 22-24 July. “Britain is famous for its sportscars but until now no one has ever been able to say which one is the best. That’s a long-running debate we have now put to rest,” said Silverstone Classic Event Director, Nick Wigley. And the result is fitting, for the E-type’s birthday is being marked at this month’s Silverstone Classic with two headline races with up to 58 examples taking to the grid. The organisers are also hoping to set a world record with a cavalcade of 1,000 road-going examples parading around the 3.66-mile long Grand Prix circuit. The three day festival of rocking and racing promises to be action-packed from dawn to dusk. With 22 races planned, racing fans are guaranteed plenty of action from huge variety of historic and classic racing cars. Among the highlights are no fewer than six races for Grand Prix cars – with more than 100 examples covering six decades of the sport – plus events for Touring Cars from the 1950s, ‘60s and ‘70s, Le Mans racers, GTs and the fearsome Group C sports cars of the 1980s. There’s also a celebrity challenge with stars such as Heston Blumenthal, Jo Wood and Brendan Cole taking to the track in identical Morgan sports cars to raise money for the Bobby Moore Fund for Cancer Research UK. That’s the racing. The rocking comes courtesy of free live concerts in the infield on Friday and Saturday evening plus more genteel classical sounds on Sunday lunch. Among the stars picking up guitars will be Suzi Quatro, 10cc and Wishbone Ash. Plenty of other off-track action is promised, too. There’s a steam traction rally, a period fun fair, go-karting, a lawnmower grand prix, aerobatic displays with a Spitfire and Mustang as well as The Blades aerobatic display team while the parachutists from the Red Devils will also be dropping in… flat-out fun for all the family. There’ll be plenty to eat and drink, too, with Jamie Oliver’s Fabulous Feats looking after the catering in the Village Green area. Classic car enthusiasts, meanwhile, will be happy simply wandering around the car parks as more than 120 car clubs will be displaying more than 7,000 classics… expect everything from ACs to Zagatos. And because there’s so much going on, a fleet of iconic London Routemaster buses will be laid on to ferry spectators around. Indeed, fans might need more than one day to see and do it all. Thankfully there’s ample camping available at Silverstone so many visitors plan to make it a weekend to remember. The Silverstone Classic (22-24 July, 2011) is firmly established as the world’s biggest classic motor racing festival and is celebrating its 21st anniversary this summer. The spectacular three-day event is staged at the famous Silverstone circuit, birthplace of the FIA Formula One World Championship and home of the 2011 Formula 1 Santander British Grand Prix. Tickets: Available in advance via the official event website www.SilverstoneClassic.com. Advance adult entrance ticket prices are Friday, £35; Saturday, £45; Sunday, £45. A two-day weekend pass is £80 or £95 for all three days. Tickets for children between 6-16 are just £5 a day. Fives and under go FREE. Ticket prices include car parking, grandstand seating, paddock access and live music.